The Julie Ann Wrigley Global Institute of Sustainability provides this list to announce seminars, meetings, colloquiums, lectures, brown bags, announcements of interest, and job opportunities to the Institute community. If you have items you’d like to add please submit them to Cindy.Zisner@asu.edu before 5:00 p.m. Wednesday. This Digest is sent out on Friday morning. You may subscribe, unsubscribe, or change subscriber settings at http://lists.asu.edu/archives/giosasu.html on the menu on the right of the page at Subscribe or Unsubscribe. You can see archives of list messages at the same address. (Sunday, April 22, 2018) Seal hunting, a critical part of Inuit life, has been controversial for a long time. Now, a new generation of Inuit, armed with social media and their own sense of humor and justice, are challenging the anti-sealing groups and bringing their own voices into the conversation. Director Alethea Arnaquq-Baril joins her fellow Inuit activists as they challenge outdated perceptions of Inuit and present themselves to the world as a modern people in dire need of a sustainable economy. Doors open 5:30 p.m.; showtime at 6:00 p.m. at Marston Theater, ISTB4, Arizona State University, Tempe campus. More information and registration. (Monday, April 23, 2018) Angela Cazel Jahn will defend her PhD prospectus Rearing Future Generational: A Conundrum. Faculty, students and the general public are invited. At 10:00 a.m. in room 481, Wrigley Hall, Arizona State University, Tempe campus. More information. (Monday-Friday, April 23-27, 2018) Students in the School of Sustainability will be showcasing culminating experience projects during the bi-annual SOS Student Showcase. Please join us as Wrigley Hall opens its doors to highlight student research, projects, coursework, and internships from the Spring 2018 semester. More information. (Tuesday, April 24, 2018) Join us as School of Sustainability students reflect on what they saw firsthand regarding the impacts of tourism and how they plan to help develop solutions to the challenges that Cuban people are facing. They had to opportunity to visit Cuba during spring break. From 1:00-2:00 p.m. in room 481, Wrigley Hall, Arizona State University, Tempe campus. More information and registration. (Tuesday, April 24, 2018) M. Sanjayan, Conservation International will present Can Nature Save Us? Stories from the Natural World from 1:30-2:30 p.m. in room 236 (Mohave), Memorial Union, Arizona State University, Tempe campus. More information and registration. (Wednesday, April 25, 2018) In partnership with Conservation International, the ASU Center for Biodiversity Outcomes will be hosting a series of speed talks by the ASU-Cl professors of practice on their respective research areas. This will be a great opportunity for faculty to learn more about their work and find out ways to get involved. From 9:25-10:25 a.m. in room 481, Wrigley Hall, Arizona State University, Tempe campus. More information and registration. (Wednesday, April 25, 2018) Join ASU students, faculty, and Apache Junction staff for the Spring 2018 End-of-Semester Project Showcase! From 12:00-3:30 p.m. in room 207 (Gold), Memorial Union, Arizona State University, Tempe campus. More information and registration. (Wednesday, April 25, 2018) Join graduate and undergraduate students of SOS 498 and SOS 594, who worked with NGOs and university partners in Indonesia and India to address sustainability challenges in the areas of agriculture, tourism, solid waste management and sanitation. From 6:00-8:30 p.m in room 401, Wrigley Hall, Arizona State University, Tempe campus (RSVP required by April 20). More information and registration. (Thursday, April 26, 2018) Students graduating from the MSUS program will be presenting information about the project they chose to focus on as part of their culminating experience. From 9:00-11:00 a.m. in room 401, Wrigley Hall, Arizona State University, Tempe campus. More information. (Thursday, April 26, 2018) Jacob Bethem will defend his PhD prospectus Energy Ethics, Transitions, and Indigenous Communities. Faculty, students and the general public are invited. At 11:00 a.m. in room 323, Wrigley Hall, Arizona State University, Tempe campus. More information. (Thursday, April 26, 2018) This event is the celebration and display of some of the incredible work sustainability interns have done this semester. Interns apply their talent and innovative thinking to applied experiences in professional settings including public, private, and educational sectors. From 4:30-5:45 p.m. in the breezeway and room 102, Wrigley Hall, Arizona State University, Tempe campus. More information and registration. (Friday, April 27, 2018) Join us for the annual screening of two short films created by students from the School of Sustainability and Walter Cronkite School of Journalism and Mass Communication, under the direction of sustainability scientist and director of Carbon Nation™, Peter Byck. There are two showings (1) 9:00-10:00 a.m. in room 481, Wrigley Hall, Arizona State University, Tempe campus (registration) and (2) from 11:00 a.m.-1:30 p.m. in room 252, Walter Cronkite School of Journalism and Mass Communication, Arizona State University, Downtown Phoenix campus (registration). (Friday, April 27, 2018) Students graduating from the MSUS program will be presenting information about the project they chose to focus on as part of their culminating experience. From 11:00 a.m.-1:00 p.m. in room 481, Wrigley Hall, Arizona State University, Tempe campus. More information. (Friday, April 27, 2018) Join a community of experts, designers, and students around Arizona for a week of education, engagement, and entertainment exploring eco fashion, slow fashion, and sustainability in the business of fashion. Arizona ECO Fashion Week is a collaborative effort to engage Arizona designers, businesses, academics, youth, students, experts, and leaders in the community to explore a new frontier in the business of fashion: the ECO Fashion. From 2:00-3:15 p.m. in room 481, Wrigley Hall, Arizona State University, Tempe campus. More information and registration. (Friday, April 20, 2018) James Klausner, Michigan State University will present High Temperature Solar Thermochemical Processes for Renewable Energy Applications at 10:45 a.m. in room 150, Schwada Classroom Office Building, Arizona State University, Tempe campus. Contact Durella.ODonnell@asu.edu for more information. (Friday, April 20, 2018) Christopher Schuh, Massachusetts Institute of Technology, will present How Grain Boundary Segregation Enables 3D Printing of Bulk Nanostructured Metals at 12:15 p.m. in room 359, College Avenue Commons, Arizona State University, Tempe campus. Contact Durella.ODonnell@asu.edu for more information. (Friday, April 20, 2018) The School of Life Sciences presents its 25th Annual Undergraduate Research Poster Symposium. All undergraduates conducting research in life sciences are invited to attend and present a poster. The symposium will be from 2:00-5:00 p.m. in the Student Pavilion, Arizona State University, Tempe campus. The symposium is funded by the College of Liberal Arts and Sciences, School of Life Sciences Undergraduate Research (SOLUR) Program, and the School of Life Sciences at Arizona State University. For more detailed information. (Saturday, April 21, 2018) LEED (Leadership in Energy and Environmental Design) is simply a sustainability scorecard for green buildings. Buildings can become LEED Certified, as can people! The LEED Green Associate is the only professional designation to show employers and clients you have certified knowledge in the field. Save money by reserving your spot today and make a positive difference in your career! If you are worried about your busy schedule, fear not, as the course is entirely recorded and you can watch the part that you cannot attend or take the whole course online. This professional designation never expires and you will never have to retest if you pass now! Early-Bird Cost: $300 ($200 for full-time students). From 1:00-5:00 p.m. in room 242 (La Paz), Memorial Union, Arizona State University, Tempe campus. More information and registration. (Monday, April 23, 2018) Benny Freeman, University of Texas-Austin will present Ion Suitability, Diffusivity, and Transport in Charged Polymer Membranes at 10:45 a.m. in room 105 (auditorium), Biodesign Institute, Arizona State University, Tempe campus. Contact Durella.ODonnell@asu.edu for more information. (Monday, April 23, 2018) Jed Fuhrman, University of Southern California will present From the Microbial Loop to ‘omics. Three Decades of Marine Microbial Ecology from 11:45 a.m.-1:15 p.m. in room 202, C-wing, Life Sciences Center, Arizona State University, Tempe campus. More information. (Tuesday, April 24, 2018) Amy Kaminski, Program Executive for Prizes and Challenges at NASA Headquarters will present NASA, Public Engagement, and the Quest for Human Space Flight Legitimacy after Apollo from 12:00-1:15 p.m. in La Paz, Memorial Union, Arizona State University, Tempe campus. More information and registration. (Wednesday, April 25, 2018) Susan Rosenberg, Baylor College of Medicine, Houston will present Why Cancers and Infections Beat Us and How to Turn the Tables from 6:00-7:00 p.m. at the Marston Exploration Theater, ISTB4, Arizona State University, Tempe campus. Cosponsored by The Arizona Cancer and Evolution Center and the Beyond Center for Fundamental Concepts in Science. More information and registration. (Thursday, April 26, 2018) Jens H. Kuhn, National Institute of Health, National Institute of Allergy and Infectious Diseases, Integrated Research Facility, Fort Detrick will present Ebola: An Example of Fake News, Trickery, Imperialism and Other Pitfalls Penetrating Science from 12:00-1:00 p.m. in the Auditorium, Biodesign Institute, Arizona State University, Tempe campus. More information and registration. (Thursday, May 3, 2018) Rebecca Winthrop, Brookings Institution will present Can We Leapfrog? The Potential of Education Innovations to Rapidly Accelerate Progress from 4:00-5:00 p.m. in the Carson Ballroom, Old Main, Arizona State University, Tempe campus. More information and registration. (Saturday, April 21, 2018) Produce On Wheels With - Out Waste (P.O.W.W.O.W.) disperses 10 million pounds of fresh, rescued produce annually to communities at various sites throughout southern Arizona and the metropolitan Tucson and Phoenix service areas. Contribute $10 to shop for up to 60 pounds of fresh produce for your family or to share with neighbors friends, or someone in need. P.O.W.W.O.W. is hosted by Changemaker Central @ ASU which exists to create a university-wide culture that empowers students to apply their passion, knowledge and expertise to create innovative solutions to local, national and global challenges. Distribution of produce will take place from 8:00-11:00 a.m. at the Tempe Public Library, 3500 S Rural Rd, Tempe. For more information contact Kendon.Jung@asu.edu. (Saturday, April 21, 2018) The Renew Artisan Fair will take place at the Red Mountain Multigenerational Center, 7550 E Adobe Rd, Mesa, Arizona 85207-4702. This event will focus on supporting local businesses who have sustainable practices (repurposing, reusing, recycling, upcycling, handmade, etc). 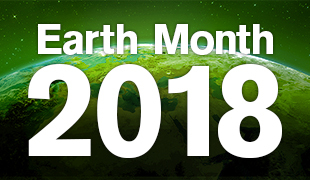 It is also part of Earth Week! From 9:00 a.m.-1:00 p.m. More information. (Sunday, April 22, 2018) Join Watershed Management Group for some fun in the sun as we ride our bicycles along the canals to learn about our local water infrastructure. *EARTH DAY* themed ride! Join WMG for this special sunset ride as we celebrate and give thanks to Mother Earth for all she provides for us - especially water! For more information and registration. (Saturday, April 28, 2018) Arizona Sustainability Alliance (AZSA) is partnering with Tree Matters to do a tree planting from 7:00-10:00 a.m. The project is funded by International Paper. The event will take place at The New School for the Arts & Academics in Tempe. AZSA will plant 19 trees with the help of our arborist. These trees will contribute to Tempe's Urban Forestry Master Plan. If you are interested in volunteering and learning how to plant trees, please sign up here. (Sunday-Tuesday, April 29-May 1, 2018) The 2nd annual Next Generation Water Summit focuses on water conservation and water reuse in the arid Southwest. It brings together builders, designers, architects and water professionals to share best practices and brainstorm new ones through charrettes. It will be held at the Santa Fe Community Convention Center, 201 W Marcy St, Santa Fe, NM. More information and registration. (Tuesday, May 1, 8, 15, 22, and 29, 2018) Watershed Management Group's popular water harvesting series is returning to Mesa! Classes are every Tuesday in May from 6:00-7:30 p.m at Mesa Main Library, 2nd Floor Saguaro Room. Whether you want to finally start that home landscape project or simply learn different ways you can conserve water, Hydrate Mesa is for you! In addition to water-saving knowledge, we'll also be providing great giveaways and prizes for attendees. Register online or for more info contact Ryan Mores at rmores@watershedmg.org. (Sunday-Wednesday, July 22-25, 2018) Now more than ever, organizations need to innovate to stay relevant in a dynamic, global environment. The theme of the 24th World Forum is consistent with the World Forum’s ten year focus on sustainability. Today, sustainable enterprises not only require innovative business practices in product design, partnerships, logistics, marketing, accounting, and finance; sustainable enterprises themselves have created new norms for what counts as innovation in business and hold the promise of redefining what effective business strategy looks like in the 21st century. The conference will take place at Seattle University, Seattle Washington. More information. (Sunday-Thursday, December 8-13, 2018) Restore America’s Estuaries (RAE) and the Coastal States Organization (CSO) are proud to host the 9th National Summit on Coastal and Estuarine Restoration and Management in Long Beach, California. The six-day Summit will explore cutting-edge issues in coastal restoration and management, and will be comprised of a community restoration event, field sessions, plenary sessions, expert presentations, special evening events, workshops, a poster hall, and an award-winning coastal exposition hall. We hope that you will share in our excitement for this new collaboration as we bring to you the largest national gathering of the restoration and coastal management community. To be held at the Long Beach Convention and Entertainment Center in Long Beach, California. There is a call for proposals for presentations, sessions and posters until April 6, 2018. More information. During a plague year, locusts affect the livelihoods of one in 10 people and cover 20 percent of the earth’s land surfaces. In most of the world, they are one of the most destructive crop pests. From 2003–05, $450 million was spent to stop a desert locust plague in Africa that caused $2.5 billion in crop damage. But an issue that size inevitably attracts the brightest problem-solvers. Read more. The UCRC recently hosted its inaugural Poster Event, at the Memorial Union at Arizona State University, Tempe campus. Five ASU schools were represented along with two collaborating institutions (University of Southern California & Georgia Tech), providing a total of 22 posters. See the winners and more information. There seems to be a B2B marketplace for any and everything. Companies such as Alibaba, IndiaMart and Amazon Business make the selling and buying process seamless for wholesale products. Except if you want to sell a less-than-perfect-looking apple. Read more. An early-stage company developing environmentally sustainable alternatives of extracting gold during mining operations — the predominant means of recovery uses the deadly chemical cyanide — is considering another application for its technology, helping capture precious metals out of electronic waste. Call it urban mining. Read more. This 2-month undergraduate internship at the Macrosystems Ecology Lab (ASU) will provide hands-on independent research at our Tempe campus lab, and nearby Sonoran Desert field sites. Projects: 1) Physiological response of desert plants to extreme heat: pre- and post- monsoon season (Research period: June and August, 2018) and 2) Desert plant leaf venation resilience strategies against leaf wounding (Research period: June and July, 2018). Student outcomes: introduction to plant ecophysiology theory and instrumentation; plant-based field experience in the Sonoran Desert; skill development for core laboratory techniques (e.g., histological preparations of biological tissues). Applicants should be: Undergraduate students currently enrolled at ASU, 18 years or older; willing to work both indoors and outdoors. Work environment: the lab is a supportive and friendly environment comprising 7 people from 5 countries. Students receive close mentoring and are integrated into group scientific and social events. Commitment: 10-20 hours/week for June-August. No previous lab experience required. Compensation: inclusion as co-author on eventual peer-reviewed publication; letter of recommendation. Possibility of continuing during academic year via SOLUR funding and/or for research credit. Funding is available to provide a competitive stipend to students from underrepresented groups (defined by WAESO as U.S. Hispanics, African Americans, Native Americans, and Pacific Islanders/Alaska Natives). To apply: email a letter of interest (<1 page), current CV, and names of 2 references to Dr. Benjamin Blonder (assistant professor - bblonder@asu.edu) or Dr. Luiza Aparecido (postdoctoral researcher – lteophil@asu.edu). More information on the lab: http://benjaminblonder.org. April is Water Awareness Month! Water Awareness Month is not only dedicated to promoting Arizona’s success in managing its water resources, it also is intended to encourage Arizonans to be conscious of every precious drop. After all, water is life to us all. Read more and see a listing of related events. The MSSC will contribute $2,500 in value to the student/professor selected. Each applicant must be a full-time undergraduate or graduate student in water resources-related degree program. Students must be enrolled in a program relating to water resources for the 2018-2019 academic year. Application deadline is June 29, 2018. More information. Environment America is a policy and action group with one mission: to build a greener, healthier world. We do all we can to move more campuses, cities and states toward 100% renewable energy, keep more fossil fuels in the ground, ban bee-killing pesticides, stop pollution of our air and water, and protect our public lands. In other words, we do it by putting our environment first. Environment America and Environment Arizona are accepting applications for summer and fall internships in our downtown Phoenix office. More information and application. March 2018 drought summary is online. The March 2018 Southwest Climate Outlook is online. To review and apply please go to https://students.asu.edu/employment/search, click on "Search On-Campus Jobs" and enter the requisition 40980BR. Application deadline April 30, 2018. Application deadline April 22, 2018. More information. Application deadline April 23, 2018. More information. Application deadline April 25, 2018. More information. Application deadline April 26, 2018. More information, search for requisition #72637. Application deadline April 27, 2018. More information. Application deadline April 30, 2018. More information. Global Science Communication Intern, World Wildlife Fund, Washington, D.C. Application deadline May 3, 2018. More information. Research Analyst, Environmental Integrity Project, Washington, D.C. Application deadline May 18, 2018. More information. Application deadline May 31, 2018. More information. Application deadline June 2, 2018. More information. Application deadline June 30, 2018. More information. More information, contact Quetzaly Aguilar. Submit applications.